Featuring Maruti’s latest design philosophy. Ciaz looks impressive from both the front and rear. High on interior space especially in case of leg room, both front and rear passengers can be seated comfortably despite being six feet tall. K14 VVT petrol engine on offer along with DDiS 200 diesel unit. Best in class claimed fuel economy figures of 20.73 kmpl in petrol while diesel stands at 26.21 kmpl. Since it is yet to be launched, pricing would be an important determinant for its success. Maruti Ciaz is a well directed effort on the part of the Indian manufacturer to provide consumers with a product that is not just attractive to look at but functionally is pretty sorted too. In its second home coming, Maruti have left no stone unturned with Ciaz considering that its outgoing sibling SX4 had over lived its shelf life and thus had lost its charm on the mind of the consumer. Launched back in the year 2007, Maruti SX4 bore a very aggressive exterior design plus had best ground clearance with its segment which attracted many enthusiasts and customers. Another USP of this sedan was its good ride and handling characteristics. Over the years, with the introduction of new segments like the compact sedan’s the likeness of such a sedan took an adverse effect which is why we today see the introduction of Ciaz to the Indian market. The Ciaz directly falls into the C –Segment thus competing against the likes on Honda City, Hyundai Verna and Ford Fiesta. Design wise it is up-to-date with rest of the competition, comfort is one area where it scores above most of them. Aerodynamic in design, the front end features a large sculpted hood along with features such as projector headlamps, which are a first considering its predecessor. The presence of a chrome highlighted 4 slat grille bearing Suzuki logo sitting right in the centre of it further adds to the appeal. So do a pair of circular fog lamps and an air intake visible on the lower part of the front bumper. Free flowing line rising all the way from the front to the rear brings forward the Ciaz’s side profile and so does elements such as chrome door handles, side view mirrors with indicator inserts along with a set of 16 inch alloys that only come on the top end variant Z+. Stepping aside for a minute, looking at just the side profile it might just strike that this sedan looks big in size. Well to mention, it has the longest wheel-base in its class amounting to 2650mm which is higher than rest of the competition within the segment. Its width stands at 1730 mm. Coming around to the rear, at first glance it would remind one of the latest generation Honda City as the tail lamps look pretty similar, the wedged shaped boot lid does add character with chrome line running almost across just above the number place. Suzuki logo sits right in centre right on top with Maruti Suzuki badge on its left and Ciaz written towards the right. An interesting element to notice is the inclusion of two plastic inserts one on the right and the other one to the left which comprise of reflector inserts giving the lower part of the rear bumper somewhat of a different design. Having said this, at the back of the mind there is a possibility of getting reminded of Honda Mobilio which also happens to feature this sort of an element in its rear design. Overall in exterior design, Maruti Ciaz is a welcome change from what we have been used to seeing for this home grown auto major. While looking at the competition, it does offer glitz and glamour that would appeal to many. ‘Glam’ factor continues inside, as dual tone interiors greet one into the cabin. The door panel comprises of an array of buttons; one for electronically adjusting side view mirrors while the others are for central locking and all four window controls on the driver’s side. The door handle comes in a Chrome finish which is for the Z+ variant. Firm to grip, a three spoke steering with mounted controls can be found in the Ciaz. What it now also offers is hand-free Bluetooth connectivity that enables the user to take calls even while driving which is a plus point. The instrument cluster comprises of two big circular analog dials, one is a speedo and the other an RPM meter. They are further supported via a circular temperature gauge and fuel level indicator along with a small digital information display giving out essential information such as distance covered, fuel efficiency, range left for refueling to mention a few. The dash offers air vents with chrome surrounds which is pleasing to the eye, so is the inclusion of a wooden finished panel that adds to its appeal. The centre console in the top end variant (Z+) offers a ‘SmartPlay’ in-car infotainment system that comprises of features such as radio, media format via USB, Aux-in, iPod, SD card, Bluetooth compatibility for hands-free calling and audio streaming, navigation, voice recognition, integrated rear view camera for easy parking and smart phone connectivity. It also supports the Android Auto and Apple CarPlay. Right below it is the climate control system that provides two round knobs for controlling temperature and fan speed. Further beneath is a plastic cover that caters to cup holders, a small storage bay and the all important Aux-in & USB port. Further the size of the glove box is pretty decent to keep all important car documents while availability of cup holders throughout the cabin (especially in door panels) and sun glass holder adds to the interior appeal. The centre front arm rest feels solid and offers space to store more stuff meanwhile the rear arm rest offers a couple of cup holders along with its utility of comfort for the rear passengers. With leather upholstery on board, an interesting feature to take notice of is the availability of a cell phone pocket stitched within the inside side of the co-passenger and driver’s seat located right above the front centre arm rest. Must say it’s a well thought out feature by Maruti. The Ciaz also offers a boot space of 510 litres of optimum utilization. Considering that its wheel base is best in class, the Ciaz offers excellent cabin space. Looking into various aspects such as head, shoulder and leg room both front and rear passengers can be seated comfortably. In fact a special reference to the rear cabin wherein a six foot tall individual has good amount of leg room despite the front seat being pulled all the way back. The inclusion of rear A/C vent and a sunscreen curtain help spruce up the interiors. Maruti Ciaz is being offered in two engine variations – petrol and diesel. The petrol model features a 1372cc engine on board providing a maximum power output of 91bhp@6000 rpm with 130 Nm @4000 rpm of torque. Meanwhile the diesel caters to a 1248cc oil mill that churns out 89bhp@4000 rpm along with 200 Nm@1750 rpm of peak torque. Both models are matted to a 5 speed manual transmission that hand out decent shifts under different driving conditions. There is also a 4 speed automatic gearbox on offer specific to petrol. Since diesel is the most preferred choice, the natural progression was to get behind the wheel and use its Start Stop feature to get started. With the press of a button, the DDiS model comes to life and one must say it is pretty silent for a diesel. Just to refresh one’s memory this is the same motor which can be found on the current generation Ertiga. In fact according to Maruti its ECU has been enhanced along with the throttle response which is evident from the manner it pulls away from an initial start. However there is a bit of a turbo lag especially lower down the rev’s which dampens the driving experience to certain limit but post that it is smooth sailing. One aspect that really took to our liking is the light clutch which is unlike any diesel and will be a boon for city users. For a top end performance there is still a bit more to be desired out of this oil mill. The petrol on the other hand, is pretty quick courtesy its linear pick-up. There is a bit of engine noise that tends to creep into the cabin making it a bit discomforting for occupants. Performance wise, there is not much of a drastic change considering that it’s ECU has also been enhanced, therefore moving around traffic in the city and as well as on the highway is a swift affair the petrol Ciaz. On the whole this particular motor is pretty sorted keeping Indian driving conditions in mind. 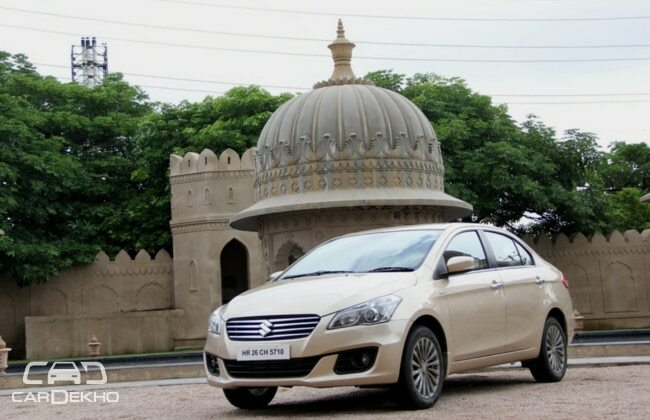 Built from scratch, Maruti Ciaz holds on to impress one and all. The engineers seemed to have struck a right balance as the sedan automatically adopts to Indian conditions without much an adieu. It soaks potholes and broken roads with ease however this is an apt situation in lower speeds. But in case of high speed, there is a bit of thump besides that not much to worry about. On a long run, like the one we did which was about a 100 km drive, both front and rear seats came across as very comfortable, ideal for long drives as well as city commute. From a driver’s perspective, the Ciaz is pretty comfortable to drive as it does exceptionally well in a straight line. However the moment one takes it around corners or bends, this sedan tends to behave a bit unsettled. To be precise, the steering lacks a feel to it. Since this is just an initial impression of the Ciaz, Maruti claims an efficiency figure of 20.73 kmpl on the petrol while the diesel stands at 26.21 kmpl. While the automatic favours to return 19.21. Like we said earlier, Maruti Ciaz is a welcome change which is bound to transform the C segment. It is a culmination of attractive exterior design, interior space thanks to its extended wheel base, level of comfort and the kind of features it has to offer on board. As for performance, the diesel model should be the preferred choice given its popularity not leaving out petrol, which too has a fair bit of grunt to itself. Maruti Ciaz is well suited to those who prefer reliability and a decent performance both within the city and on the highway. It is not enthusiast centric but still offers enough juice for users, be it the diesel or the petrol power plant that make an instant good impression in the mind. Considering some of the features it has to offer and performance, segment leaders like Honda City and Hyundai Verna are definitely going to face some strict competition from this sedan. Its exterior appeal, interior space and comfort are its biggest plus points. · A well rounded product that takes care of most concerns. · Exterior design, interior space and comfort. · Some similarity of exterior design element such as the tail gate with competition within its class. · Handling is not that pleasing as one would have expected it to be. Attractive and best suited for city use, Maruti Ciaz makes for an exciting proposition.